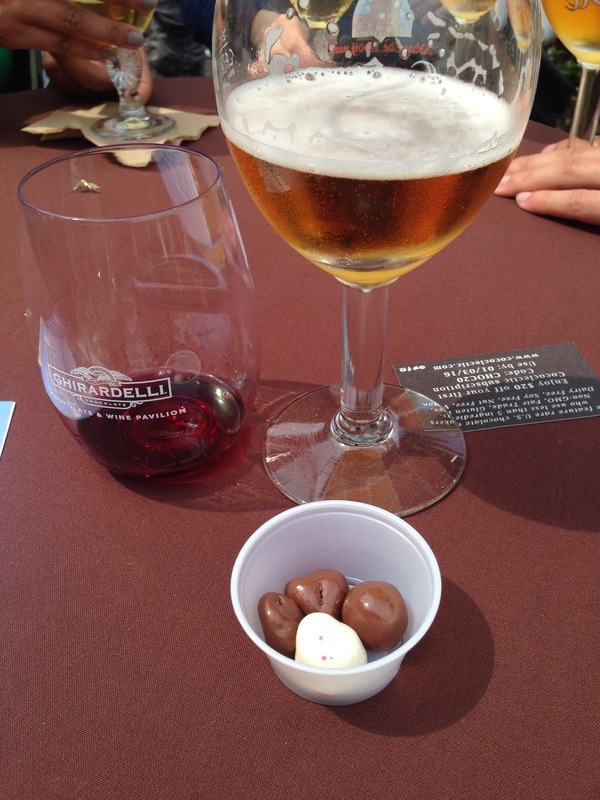 Ghirardelli, a San Francisco icon, is the perfect host, and its bayside Ghirardelli Square is the perfect setting for a festival celebrating all things chocolate. Experience the gluttony and homage to all things chocolate. 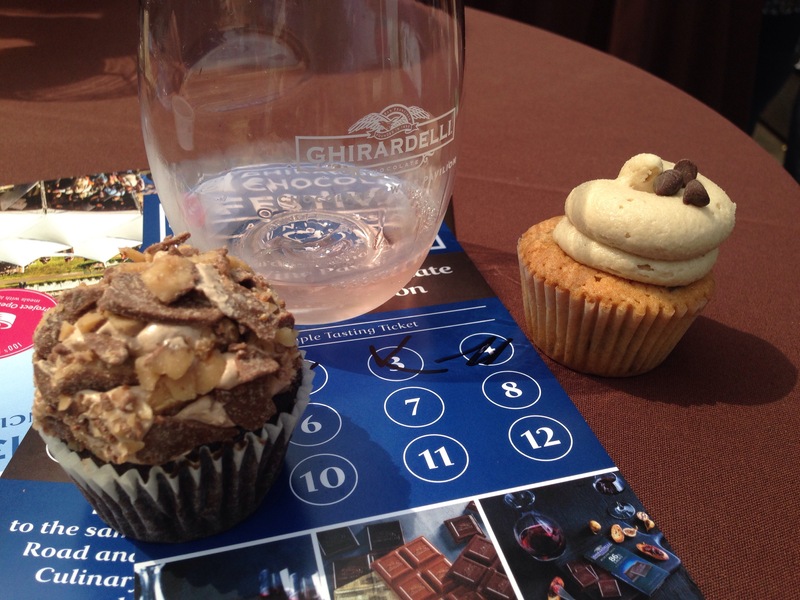 For 20 years, Ghirardelli Chocolate Company has hosted an annual chocolate festival outside its factory at Ghirardelli Square near Fisherman’s Wharf in San Francisco. Sponsored not only by its host, vendors of chocolate, coffee, ice cream, baked goods, wine, beer, and even coconut water participate. From boutique businesses to large corporations, these companies tempt festivalgoers with their products, vying for their tickets. It’s done in the name of charity; this year’s charity was Project Open Hand. Two types of tickets are available for purchase: The Chocolate Road, which allows tasting samples, and the Chocolate and Wine Pavilion, which is indulgence central: sugar plus fermented sugar. Mmm! I visited both pavilions – possibly accidentally (umm, they might have given me an extra ticket). I started with the Chocolate and Wine pavilion. I was slightly disappointed to see large, lower-quality wine producers represented. Call me a wine snob, but I tried very few wine samples that I truly enjoyed. All was not lost, however, because chocolate makes everything better, and most wine enhances most chocolates. Leffe Blond and chocolate covered popcorn. A strange but surprisingly good combination! Chocolate and peppermint covered popcorn paired surprisingly with Leffe Blonde ale of Stella Artois, offered in complimentary souvenir tulip glasses. Boutique chocolates from Socola were rich and more intense when tasted with red wine. A local cupcake confectioner distributed mini cupcakes, including an outstanding cookie dough flavor that was unlike most cupcakes I’ve tried. A moist chocolate and espresso cupcake frosted with toffee buttercream was quite a contrast from the former but was no less scrumptious. After that pavilion, I needed to take a break from the gluttony (something I never thought I would say). After a salad break, I returned to the festival, recharged and ready for more sweets. Along the Chocolate Road, Ghirardelli was front and center with tents handing out their mini chocolate bars. Nearby, rich drinking chocolate samples caught my eye. Though less intense and slightly sweeter than my favorite European varieties, the flavors evoked memories of fine hot chocolate. Get me back to Europe! Three Twins ice cream and another local vendor served up rich and creamy tastes of their frozen desserts. Vegan and lactose-free rice milk “ice cream” and four varieties each of single-origin chocolate and vanilla ice creams were a nice departure from the intensity of chocolates and truffles. Two small toffee-making companies wooed festivalgoers with their various flavors – pumpkin, Oreo, and even white-chocolate covered pistachio and Cherry flavors called my name. 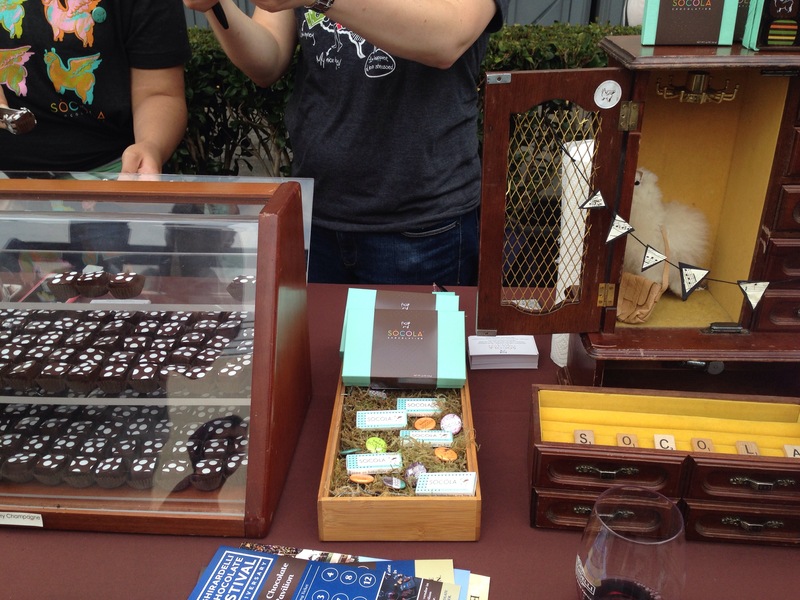 Other homegrown businesses offered small batch, fair trade dark chocolate bars, along with an assortment of truffles, cookies, and brownies. Some lines were too long for my taste, but plenty of vendors were more easily accessible. I certainly left the chocolate festival fatter and happier, if not a bit sick of chocolate. Never fear – I was right back to eating chocolate the next day! Next year or any September, should you find yourself near San Francisco, stop in to a great festival at an American icon.